This entry was posted in Drugs and tagged pharmacology, toxidrome by Ali. Bookmark the permalink. Google helped me find your image, and I feel very lucky about it. I have to hold a class about cholinomimetics and cholinolitic drugs. 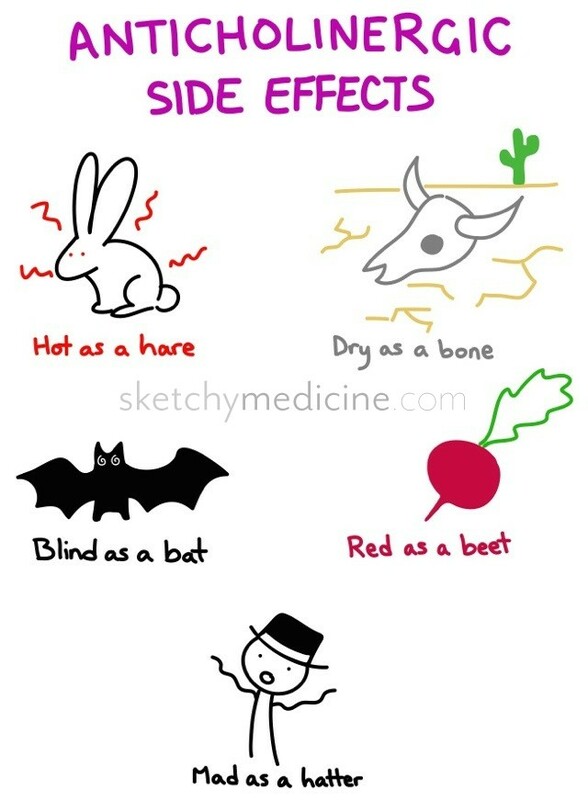 Though in my country we don’t use this mnemonic to describe the various symptoms of acute atropine toxicity, I hope I found the best way to explain them to the audience, in a kind of funny way. Thank you for sharing! For me, I prefer using ABCDs for mnemonics. Don’t forget ileus, urinary retention and tachycardia. Might consider adding the other colloquialisms “the bowel and bladder lose their tone, and the heart runs alone”. Does anyone know where this mnemonic originated?